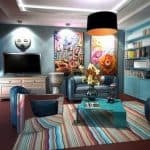 The world of residential design is moving at a fast pace, so every year a lot of old trends give way to new trends. All global brands produce such a wide range that any person can create around himself a cozy and at the same time stylish space. All this is done in order to make every single room as comfortable as possible. 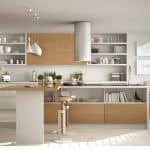 For several years, the main trends in kitchen design have remained unchanged – accessories from environmentally friendly materials that combine practicality and comfort are in fashion. To date, the interior should be able to adapt to each individual. This is especially true of the kitchen, where it is simply necessary to use the space with maximum benefit. In today’s world, not everyone will have time to clean the surface for hours. 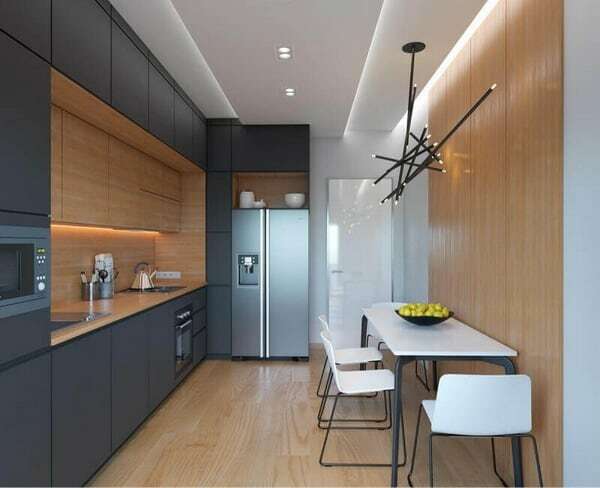 Therefore, designers are trying to design the kitchen so that it is not just practical to use, but also easy to clean. It is also important to remember about security in the room. This is especially true of the family, where there are small children. Kitchen design should be designed in such a way as to ensure maximum safety of each family member’s stay there. 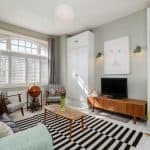 At the moment, manufacturers offer a fairly large selection of furniture and kitchen appliances, so it is possible to create the ideal space even with a small budget or on a minimum area. This applies to all rooms in the room, including the kitchen area. Most people now prefer the interior in the style of hi-tech, loft, minimalism. 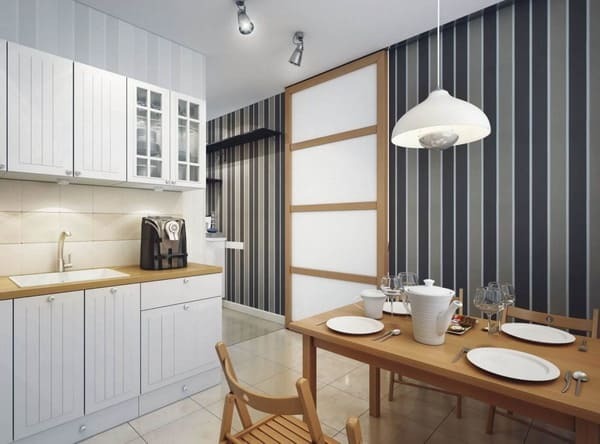 Also Scandinavian and Mediterranean styles look harmoniously in the design of the kitchen. A room with a uniform soft natural light will look more stylish than a dark one. Maximum use of each individual item. Of course, it is important to choose such furniture and appliances, which will delight you with their appearance. Well, it is much more necessary to plan the space so as to use all the objects. Mix modern technology and decoration with outdated motifs. In a reasonable measure, such an interior will look quite harmonious. You can put on the high-tech kitchen in the old buffet or decorate the walls with deliberate rubbing. The main thing – do not overdo it, let it be just one, but bright enough accent. Retro also interacts well with modern motifs. To do this, use furniture or lighting in a similar style. Many companies producing household appliances produce products that look like objects of the 60s. The most famous such brand is SMEG. When choosing a color, again, it is worth relying on the fact that today natural and pastel colors are in fashion. Particularly relevant are imitations of wood, stone or earth. Many designers are inspired by nature, embodying their ideas in interior design. Natural, natural colors like customers. These shades help to relax, give warmth and comfort in the room. 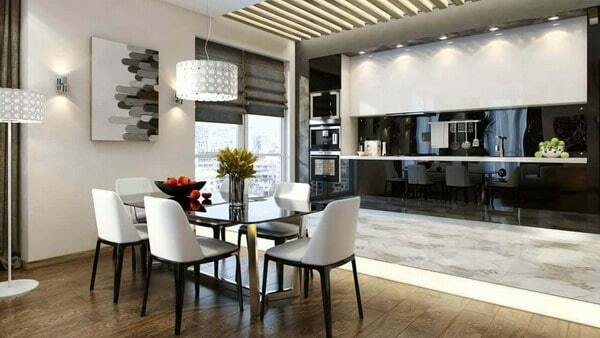 Of course, the most popular color in the decoration of the kitchen always remains white. Despite his, as it seems at first glance, impractical, it gives the room a fresh and sterile look. In addition, all variants of white are versatile and perfectly combined with all other colors. You don’t even need to seek help from a specialist — you alone can add some bright accents to a clean white kitchen. Let it be chairs, curtains, small decor items. Imagine and boldly translate your ideas into reality! Actual such a decision will be for small rooms. Everyone knows that the white background helps to visually expand the room, while the dark shades clog it. And the sun rays penetrating through the window will give the room even more free space. A separate bright spot when decorating a room in white can be the use of wooden surfaces. Here you have the opportunity to use absolutely any kind of wood – from light birch to dark wenge. In combination with ultra-modern household appliances such a solution will look stylish and bold. Does not lose popularity and contrast method. Many designers continue to beat the combination of black and white tones, at what they do it very well. 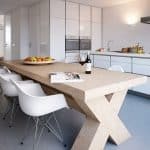 If you want to dilute this contrast and give it a bit of smoothness in the transition from one shade to another, choose wooden inserts, such as worktops, built-in furniture facades, a table or chairs. After white, the most popular is gray. It is also quite neutral in itself, so it easily interacts with bright hues. It is easy to combine with many types of trees or interspersed with bright colors. In addition, gray has a relaxing effect on the nervous system, calms and makes it possible to feel comfortable. Fewer people prefer bright kitchens. 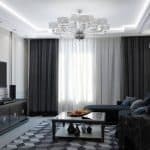 Of course, you can arrange them so that they look stylish and do not irritate the eyes, but for this it is imperative to need the help of a specialist. But with neutral shades you can independently figure out even those who first decided to make repairs. If in the living room or in the bedroom you have no limits on the choice of decoration, then the kitchen space dictates its own conditions. After all, it is here that many processes occur every day that provoke a temperature difference or an increase in humidity. Therefore, all materials must be of high quality and have good wear resistance. Fortunately, modern production technologies have helped expand the selection of finishing materials. It is also important to remember that the walls, ceiling and floor in the kitchen is not the main highlight of the room. The main role here is still played by built-in furniture and a dining area. 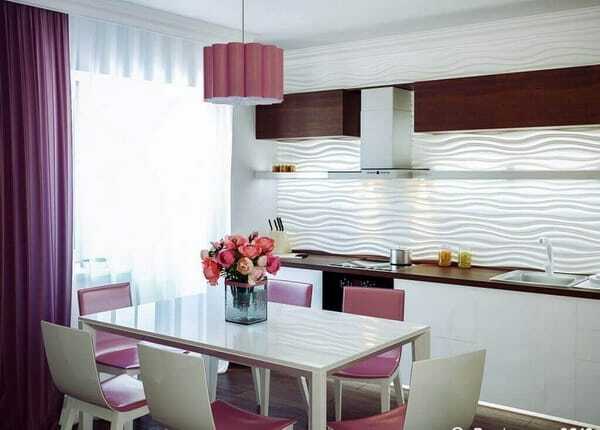 Therefore, many people choose monochrome wall decoration using neutral or pastel shades. Large or frequent prints are used less and less often, but more often you can see the use of contrasting versions of wallpaper or painting. glass or metal – can often be found when you make aprons. To date, a kitchen furniture set should combine a stylish appearance and ergonomics. Here it is important to be able to combine aesthetics and practicality in each individual element. No matter what design you choose for your kitchen, in any case, each of its components should be simple in daily use and easy to maintain. Modern manufacturers offer you such fittings, which qualitatively use every centimeter of allocated space. If several years ago, ready-made modules for storage were popular, today many customers choose custom-made accessories tailored to the room’s parameters. 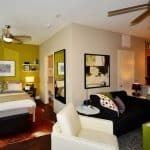 This is due to the fact that the layouts of apartments can be radically different among themselves – in fact, modern developers prefer the originality of the idea, and not the traditional ways. In addition, the abundance of both large and small household appliances makes competent use of free space. Smooth facades. For several years now they have not given up their positions. Such a facade will perfectly fit into any modern interior. It looks laconic and creates a sense of minimalism. Textured surfaces. Although they can be called the complete opposite of the previous point, such facades also take place. Most often today, the choice of customers falls on an array of wood with a distinct texture. It can be used as a window sill, table or table top. Open shelves. This method of storage has become popular recently, pushing aside closed kitchen cabinets. It is especially suitable for small kitchens, where the presence of a large number of closed storage systems can visually reduce the room. In addition, such shelves are also an element of decor – they can accommodate jars of spices, wine, beautiful dishes. All this will be a great accent in the room. We should also talk about the dinner table. Here, fashion trends do not play any role, because the choice of a particular model should be determined by the number of people living in the apartment and the frequency of reception of guests. Someone will need a large table at which the whole family would gather every day, and someone would have enough of a small bar counter. attractive appearance, providing home comfort. Rectangular and square tables should be placed in the event that it is demanded by style features of rooms. In them, by the way, also some brands today slightly round corners. 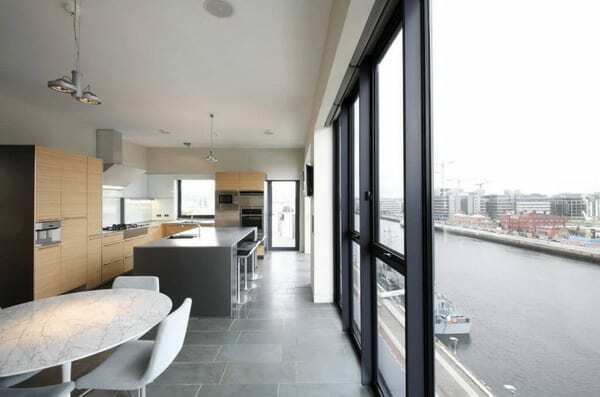 If you have a large kitchen, but frequent receptions of guests are not your lifestyle, it is recommended to use special islets where you can cook dinner. In some cases, they can put a small tabletop to create a small table. Bar stools attached to it will add variety to any interior. 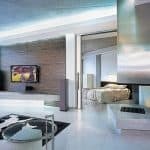 Modern design projects are minimalist in everything, including the use of decorative elements. Especially rarely such items are found in the kitchen, where mostly practical things are placed. After all, it is necessary to create such a layout, which will arrange the location of numerous storage systems, equipment and dining areas. In this case, decorating with various details will only enslave the room and make it more clogged. 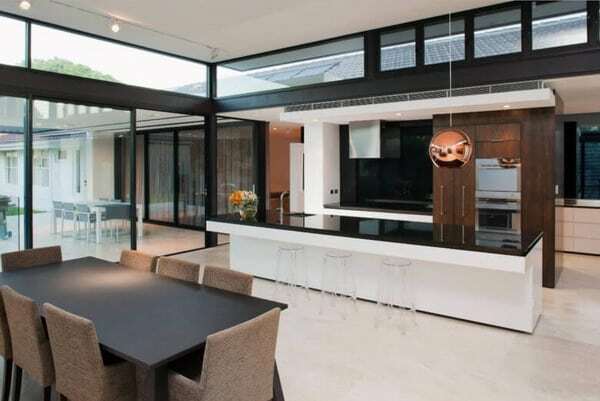 That is why, in order to give the kitchen an aesthetic look, they use quite practical components – plants, beautiful sets of dishes, fruit vases or lighting systems. In such a discreet design, you can often achieve more creativity just by using lighting. They not only stand out against the general background, but can also become the main highlight, uniting around themselves the rest of the accessories. Textiles can be a prominent spot. Let it be a corner or chair upholstery, a small sofa or a bright tablecloth. All this will bring a bit of originality and definitely attract the attention of guests. Of course, whatever one may say, but it is difficult to manage without decoration even in such a functional room as the kitchen. That is why a huge number of companies today are trying to stylize any items used in this room. You have the opportunity to add some creativity with the help of the original mixer. To date, most manufacturers produce chrome models, some of which are equipped with lighting. The kitchen is not just a place for cooking, but also an excellent area for the realization of fantasy. It can miraculously combine ergonomics and home comfort. 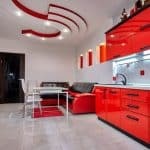 But for this it is worthwhile to plan the space correctly, taking into account the possibilities of each individual room and new trends, which make it possible to feel comfortable in the kitchen.As the owner of the apartment, and his guests.